The Pixar Treasures is an amazing book for anyone who fancies themselves a Pixar fan. 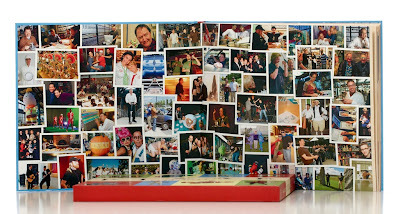 It's full of great photos, interesting facts and fun keepsakes - this book is more like your very own Pixar scrapbook! 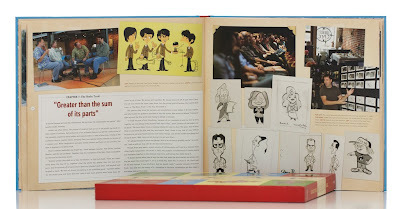 Kept in a hard outer shell, The Pixar Treasures written by Tim Hauser and published by Disney Editions, is full of 64 pages of candid/press and advertising photos. With information from the beginnings of Pixar until the release of UP, this book has it all. Fun fact - if you look closely in the photo below (one photo to the left of the bottom-right image) you can see a photo of what seems to be of a Brave research trip - what do you think? 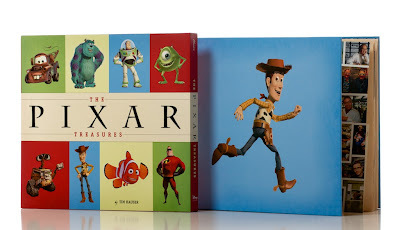 The Pixar Treasures is composed of 28 chapters, so I won't divulged all the info from each chapter - I'll just highlight some from my favorite chapters. Chapter One "Inspiration surrounds us"
Discussing the cycle of inspiration and how it began with memories of Walt Disney films, Ed Catmull states "Our story and production are derivatives of the Walt Disney 'school' of animated film making. Just like the Disney classics, Pixar's films are made for family audiences the world over - and, most importantly, for the child in everyone." One of my favorite photos on this page is that of Pixarian Jason Deamer working at his desk. I am so inspired by his work as a character designer, he is a true artist and I was really happy to see a glimpse at him working on his craft. Chapter Three "Learning from each other"
This chapter focuses on the ties with Pixar and CalArts. "In my senior year, I received a letter that they were starting a character animation program at CalArts. I applied, and I was the second person accepted to the program in 1975," recalls John Lasseter. Competition was tough and the future animators found that working and collaborating together as a team seemed to be more educational than the courses itself. "It was the people," says Ralph Eggleston (One of T.J.'s favorite Pixarians). Chapter Four "The sorcerer's apprentices"
Discusses the apprenticeship program at Walt Disney Productions. Did you know that John Lasseter, Brad Bird and Joe Ranft were hired into this apprenticeship program in the late 70's-early 80's? Amazing, right?! What's even more amazing is that they worked along side some of the "Nine Old Men" that were still present at the studio well past retirement, waiting to pass the animation torch onto the next generation. In this chapter you can also see a rendered shot of Frank Thomas and Ollie Johnston as they looked during the end of the The Incredibles movie. Chapter Five "Making it up as we go"
Goes into some of the the technical experiments from the Pixar team. "Ed Catmull. He had this rare gift in that he, in a sense, could have been Albert Einstein or Walt Disney," offers Randy Nelson, looking back at Pixar's origins. "He loved animation, and he drew reasonably well, and his passion was endless. And he also had this incredible gift in terms of physics, and as an artist who is a mathematician, to be able to recognize digitalization." Chapter Seven "The Brain Trust"
This chapter is one of my FAVORITES! It's rather short and to the point, but it discusses the friendship, camaraderie and collaboration of the "brain trust" within Pixar. 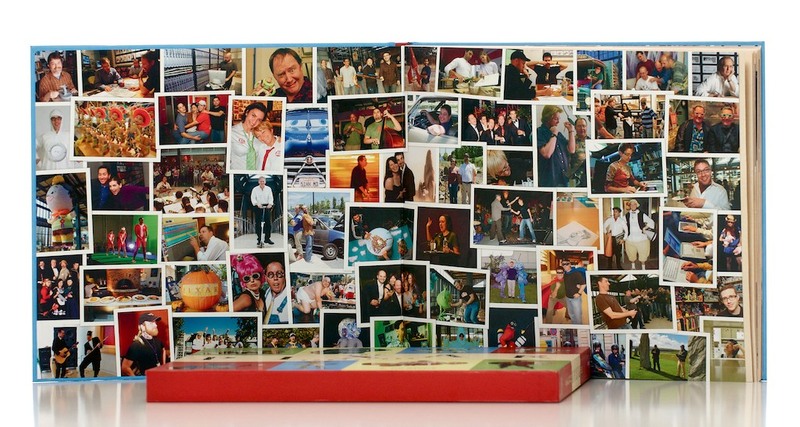 My favorite photo (shown below - upper-left) is the one of Joe Ranft, Andrew Stanton, Pete Docter and John Lasseter. This picture captures what seems to have been Joe Ranft making the team laugh - this is my favorite photo in the entire book. 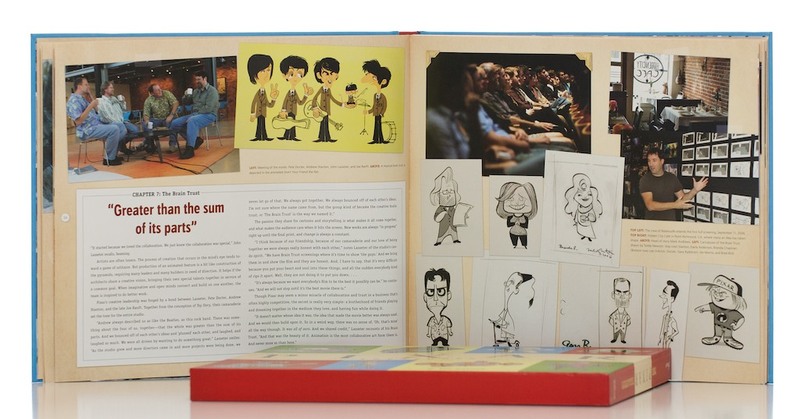 The other great photos in this chapter includes a photo of Mark Andrews walking through the story of Ratatouille, the now closed Hidden City Cafe and caricatures of Andrew Stanton, Darla Anderson, Brenda Chapman, Lee Unkrich, Pete Docter, Gary Rydstrom, Jim Morris and Brad Bird. Chapter Eight "If a toy were alive, what would it want? "What I remember is when Toy Story came out is that we had clearly tapped into a collective unconscious," remembers Lee Unkrich. "My wife used to sit on her bed with all her stuffed animals, and when no one was around, she'd say, 'Please, please, I won't tell anyone, but if you're alive, just give me a little sign,'...Everyone can relate to it. But I think what really got to people was that we created personalities that were really compelling and concepts that people could relate to, that especially adults could relate to." If you love Toy Story - chapter eight is for you! Chapter Ten "A family of characters"
Toy Story 2 will always have a special place in T.J.'s and my heart. It was our first 'movie' date back in 1999, we loved it so much that we went back the following morning to see it again - a tradition we still keep to this very day. "We haven't made many sequels, but when we have, it's because we really believe we have a good story to tell," notes Lee Unkrich. I agree, I believe Pixar has definitely lived up to each of their sequels including Cars 2 (we really enjoyed it - it's just a fun spy movie). Chapter Twelve "A home away from home"
Pixar studios breaks ground and moves to Emeryville, California. There are photos of the old and new campus - both of which are legendary as it's where the magic of Pixar takes place. The best quote of this chapter was by Producer Jonas Rivera speaking of Pixar's residence in Emeryville. "If you look at this building, it's a bit of an analogy. That's partly reflective of the past of this place, but it's a bit of right brain, left brain, - You've got the left side, which is filled with computer scientists, shading, modeling, lighting and rendering...and over here on the right side, we've got editorial, story, animation and art." Chapter Fourteen "Animation is the most collaborative medium"
What I found to be really interesting was the Hidden City Art Department work flow chart & The Pixar Production Process chart that was included on this page, both of which were fun and informative. "We want to help each other succeed, and we want the movies to be great," explains Lee Unkrich. Another fun touch to this chapter were the stamp marks on the pages that seem to resemble some Pixarians - Andrew Stanton, Brad Bird, Pete Docter and Bob Peterson. Chapter Sixteen "The search for entertainment"
This chapter is storyboarding, storyboarding, storyboarding! With photos of the storyboards from Ratatouille, Monsters Inc, and a photo of the Pixar staffers paying homage to the Nine Old Men...and from what I can see, it looks like La Luna Director Enrico Casarosa holding a ukulele. 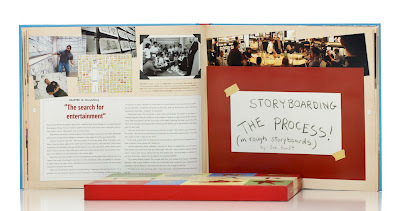 The photos are one of the best parts of this book, it truly is a fun scrapbook for Pixar fans. Looks into Finding Nemo, the only thing that I will point out from this chapter is the amazing craftsmanship of the giant Bruce the Great White Shark that is swimming through a wall at Pixar Animation Studios. If this intrigues you, then you'll love the booklet on the sharks within this chapter. Chapter Twenty-Five "Irrational love defies life's programming"
This chapter is based around the film Wall-E, which is my tied for my favorite Pixar film along with Monster's Inc. and now Brave. This chapter is full of great quotes, photos and sticker keepsakes - one photo that grabbed my attention was of the Wall-E mini red lunch-cooler, it's just as amazing as it sounds! "The question I know I'm gonna get asked for the rest of my life is, 'Why Hello, Dolly?" Stanton sighs. To me, nothing can capture the emotion in Wall-E's eyes quite like the song "It only takes a moment" - absolute perfection. We can't recommend this book enough - it is amazing to see all the photos, removable cards/posters and other Pixar details! Click on the link below to purchase from Amazon.